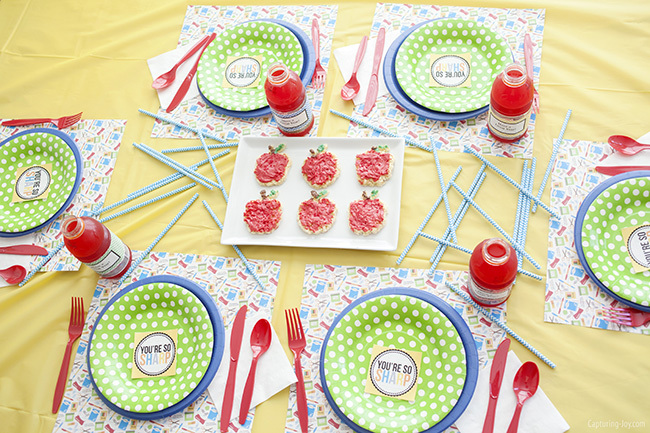 I love to have a Back to School dinner for the kids, and choosing a theme for the year. 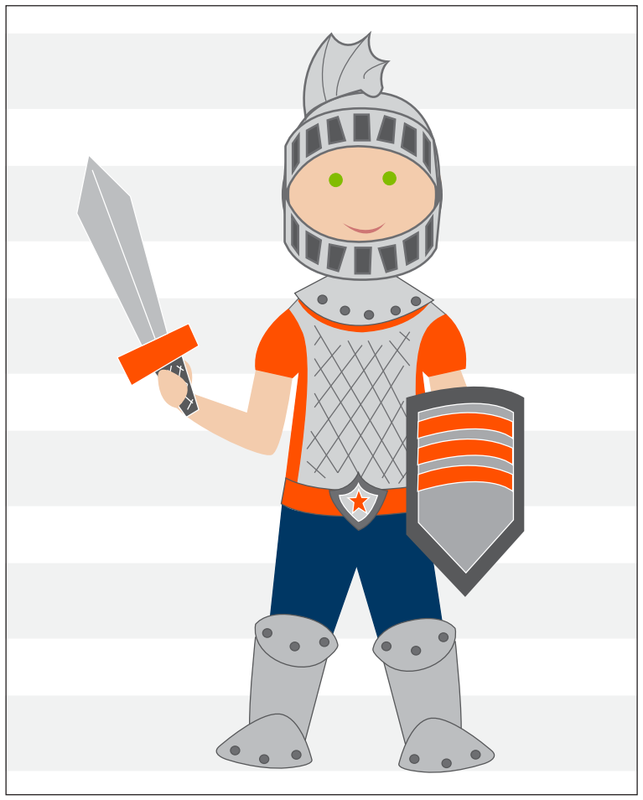 This is our Armor of God lesson idea, see the fun pictures and free prints below. Choosing a themes is to help my kids to think about a purpose starting the school year, but this makes for a great lesson any time during the year. My kids got so excited when they saw me setting the table, and first asked if someone was coming over for dinner, or if we are having a party. Yes, I said, we are celebrating YOU! 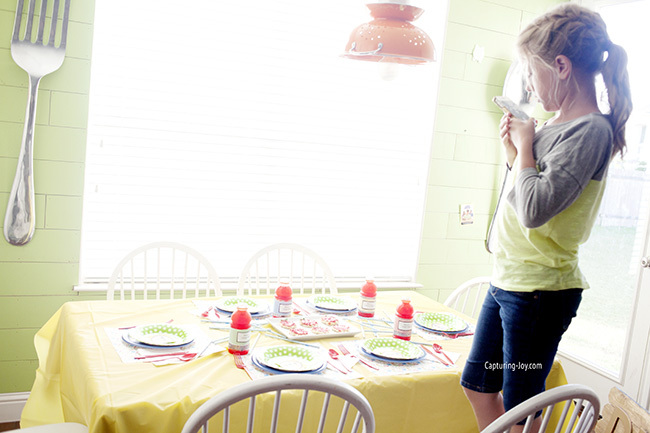 We’ve done a back to school dinner a few times before, but they weren’t quite expecting it. 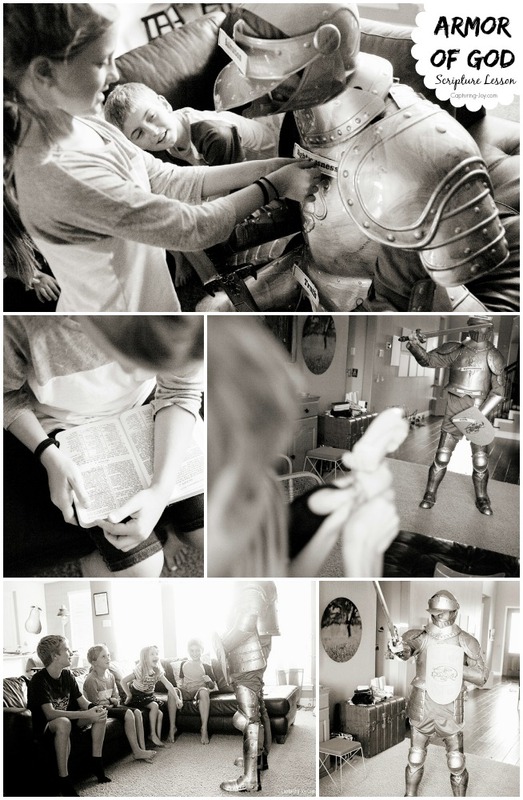 I wanted to share the Armor of God Lesson I prepared, and offering with FREE prints below! 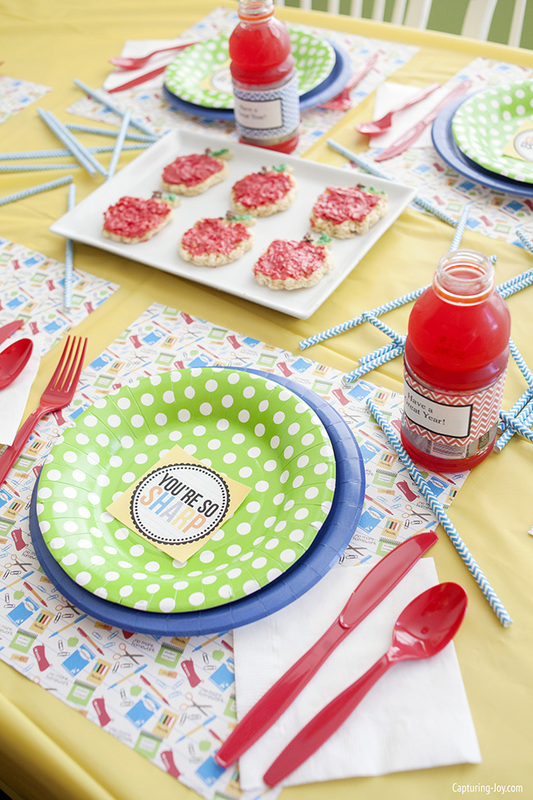 The rest is scrapbook paper and colorful plates, etc. I planned to make the “apple” donuts from Your Homebased Mom, but had some issues. 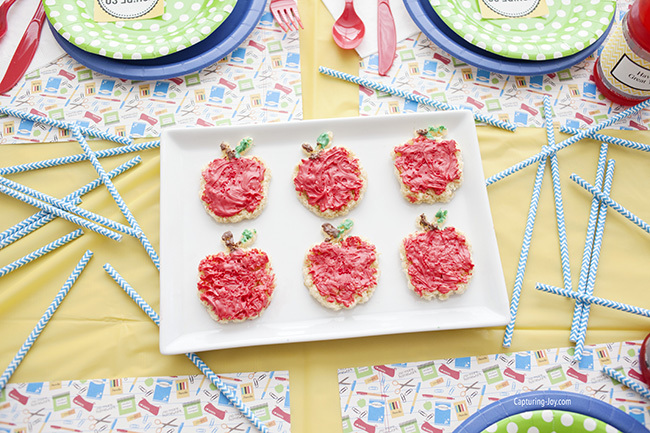 So our treats were store bought rice krispie treats that I smashed flat, cut out an apple shape, spread melted chocolate on (with my finger) and voila! My kids loved it! 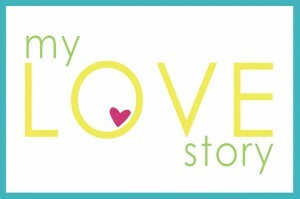 I had their favorite meal–Hawaiian Haystacks–and we had a fun and relaxed dinner. 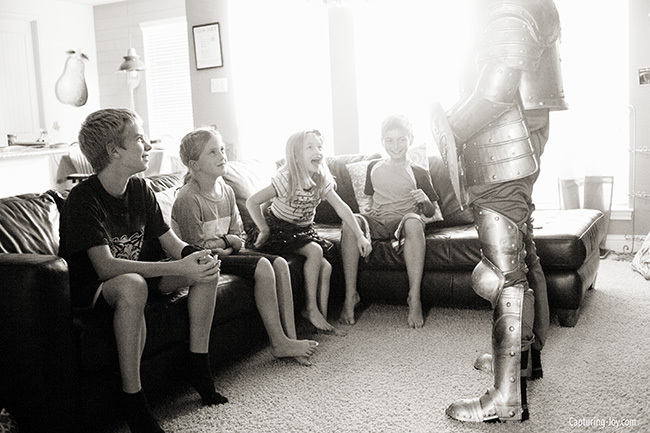 After, we had our traditional Monday night Family Home Evening lesson, but I made it EXTRA special because I wanted to introduce a back to school theme: Put on the Armor of God. 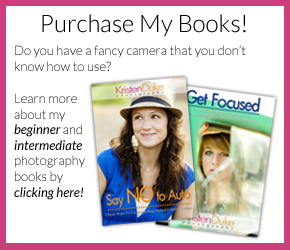 I found SO many great resources online. 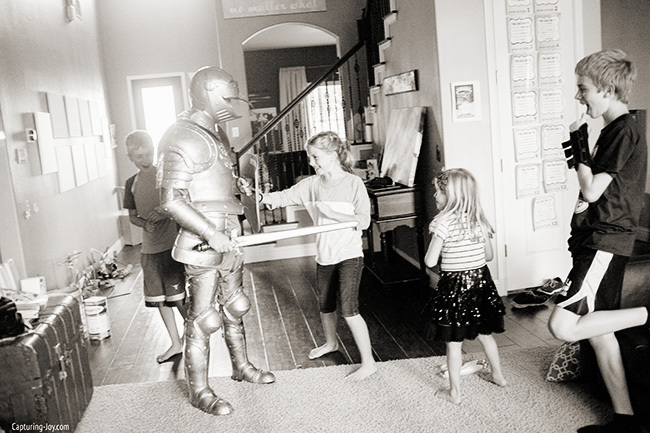 I went to Pinterest and simply typed in “Armor of God.” After weeding through some stuff, I found two great outlines online, one at Funtastic Family Home Evening and the other at LDS Living. 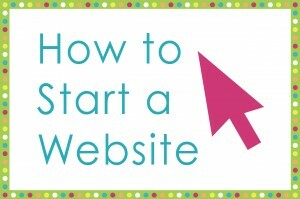 In those two links are great outlines for conducting your own lesson. Now to the Armor of God Lesson! There are lots of fun tutorials to make your own armor, but I wanted to do something extra memorable. I looked around online and found an armor costume (affiliate). I hemmed and hawed over it, and decided it was worth it to plunk down some cash, and it would add to our costume stash. 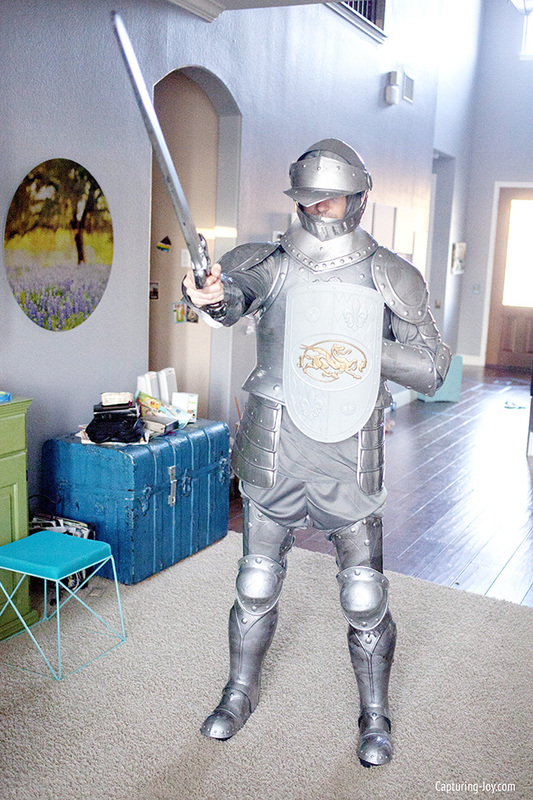 I have a child that is REALLY into knights and such, too. I almost went crazy looking for a full on tin knight as a home decoration, but my husband convinced me that my brain had gone too far. Enter, the Knight in Armor! The kids thought it was pretty fabulous! They took turns trying to “fight” the knight, then I began with the lesson. In short, we talked about the importance of putting on the Armor of God as a protection when they go out into the world every day. It’s a battlefield, there are so many “fiery darts” the advesary is trying to throw at us, little ways of deception, that you need to be ON. YOUR. GAME. We emphasized that the armor part is mostly a protection, but that the sword is different because it is a weapon. The sword symbolizes the Spirt of God. So as we are making choices good enough that his Holy Spirit will want to reside in us, that in turn helps us to make good choices, and is a TOOL used to help us fight the evils of the world. 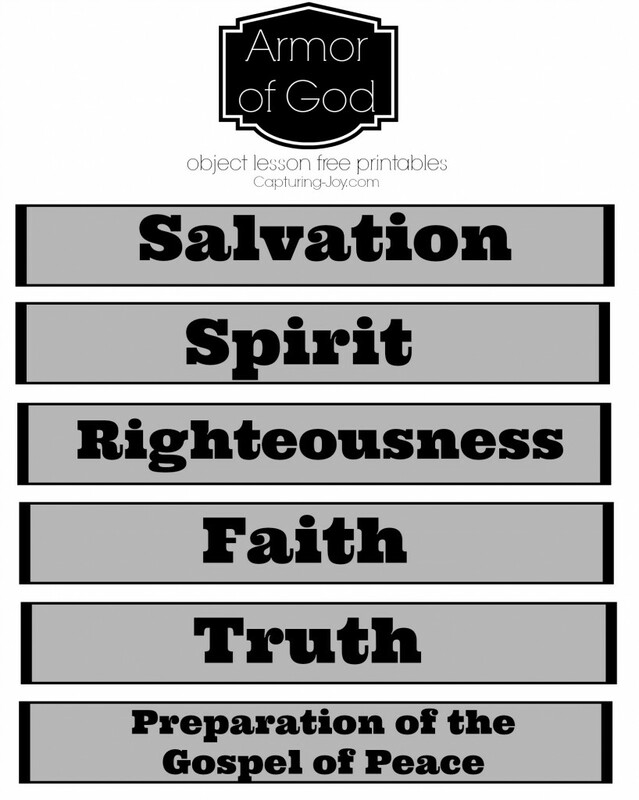 For the Armor of God Lesson, the scriptures in Ephesians 6:11-16 explain what each piece of the armor does spiritually, and we matched them up with a word strip I made. After we went through all the explanations, the kids took turns shooting some fiery (nerf) darts at the armor. Those darts are Satan’s tools to tempt us, to try to drag us down so that we lose portions of the Spirit, and feel bad about ourselves. We gotta fight off those darts! As usual, I was trying to get some deep, serious conversation going, and my kids were a little hyped up, but hopefully they get the overall message. I like the strong image that the armor provided, and I hope it sticks with them, the importance of arming themselves with goodness to fight off the crazy out there in the world. It was fun, and we’ll definitely do it again as a refresher! I made this word strip that we taped to the parts on the armor. If you don’t have a real armor, or don’t make one out of foil and cardboard, you can always tape smaller strips to the cute little guy below. 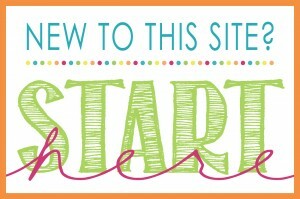 In case you missed the printables I shared previously with the kids in their armor, go download them, and use them as reminders for your kids around the house (I’ve got a girl, too). 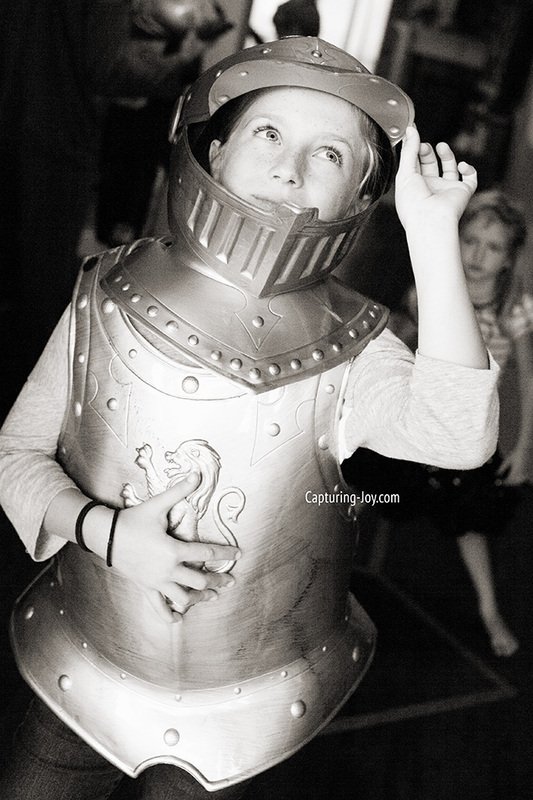 Hope you enjoy this Armor of God Lesson idea, and can find a way to implement in your family!